Babies develop a myriad of skin conditions during the first few months of life. These include cradle cap, diaper rash, toxic erythema, milia, infantile acne, and others. Some are caused by normal hormonal changes or immature pores, while others are caused by inflammation or, rarely, an infection. Because most newborn's rashes are "normal", there is generally no treatment needed except for patience. It's important to ask the doctor for some guidance about what to expect when it comes to rashes and which require some additional treatment. Acne neonatorum also called neonatal or baby acne is caused by maternal hormones. The same hormones (estrogens) are involved in causing acne in adolescents. The big difference is that this will resolve on its own within a couple of weeks, and no treatment is needed. 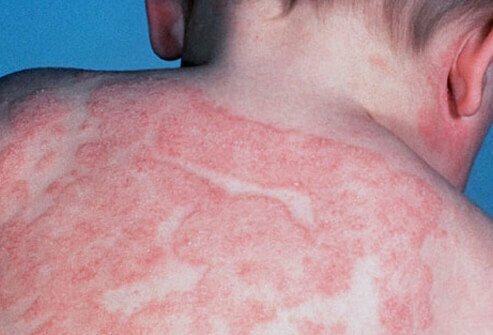 Erythema toxicum neonatorum is the most common pustular (fluid-filled) eruption in newborns. 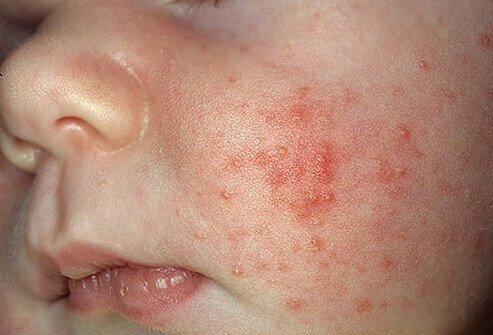 More than half of all newborns develop this rash usually within two to three days after birth. Generally, the rash appears on the face or extremities and initially as a red raised eruption. Then they develop into a pustule with a "blotchy" appearance. The cause is unknown, however the lesions fade after a week, and there is no treatment needed. Sometimes this is confused with more serious infections of the skin. If there is fever associated with the eruption, further evaluation is needed. 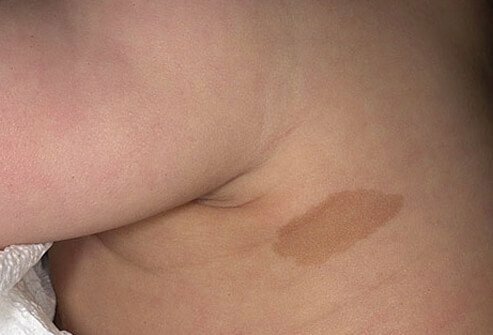 Birthmarks can be found in 5%-10% of all babies. Most of these are common nevi (areas of skin discoloration) and need no further evaluation. Birthmarks are generally divided into three groups: pigmented, vascular, and anatomic. Some birthmarks develop over time, and some are present at birth. Always talk to a pediatrician about any concerns about birthmarks. 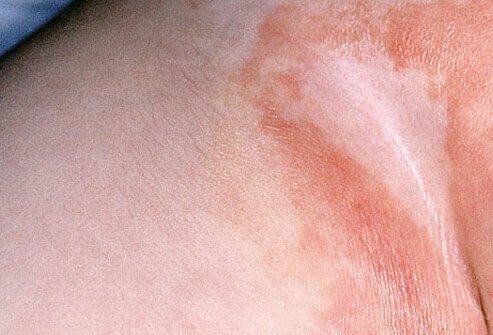 Eczema, also known as atopic dermatitis, is a pruritic (itchy) rash that occurs in response to a specific exposure or allergy. It is generally seen in children over 3 months of age and appears most commonly on the scalp, face, trunk, extremities (elbows and knees), and even in the diaper area. Treatment is focused on avoiding the trigger and then allowing the skin to "heal." This may include using moisturizers and even topical steroids. Newborns often have very dry peeling skin in the initial period after birth. This is due to the fact that the infant has existed in a fluid environment for several months, and after birth, the skin cells start to regenerate, which results in the peeling of the old skin cells. There is no need to do anything since this will resolve on its own. 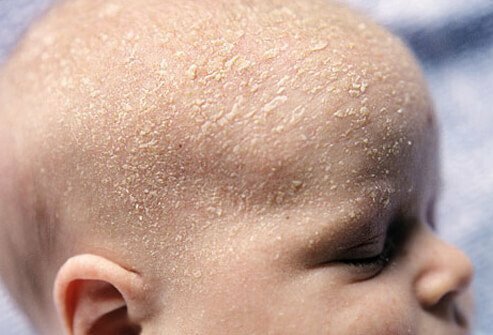 Cradle cap, also called seborrheic dermatitis, is a very common rash seen in newborns. The rash, usually seen in the first month of life, starts on the scalp and has a red, waxy, and scaly appearance. Sometimes the rash can extend to the face and neck. It is not generally itchy, and although it will resolve on its own, the treatment may include a special shampoo, petroleum jelly, and even a topical steroid. Prickly heat is also known as miliaria rubra. It is due to a sweat gland dysfunction. The rash appears on the neck, diaper area, armpits, and any skinfolds most likely to be prone to increased sweating. The rash may itch as well. Keep the infant cool (in the summer and winter) and it's likely the baby will avoid this reaction. In most cases, prickly heat resolves within a couple of days, but speak to a pediatrician about other options if it persists. Although "baby powder" seems like an important item to have for an infant, it is generally not needed. Regardless of that, it is extremely important to avoid talc-containing powder, since there is a risk for accidental inhalation and subsequent lung problems. 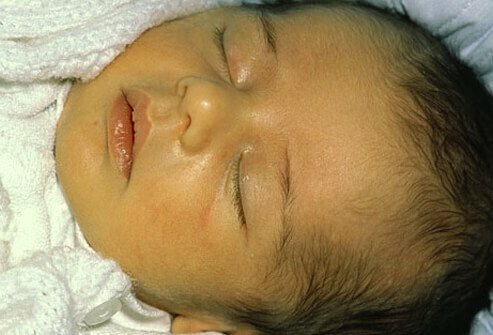 Milia occur in 50% of newborns. 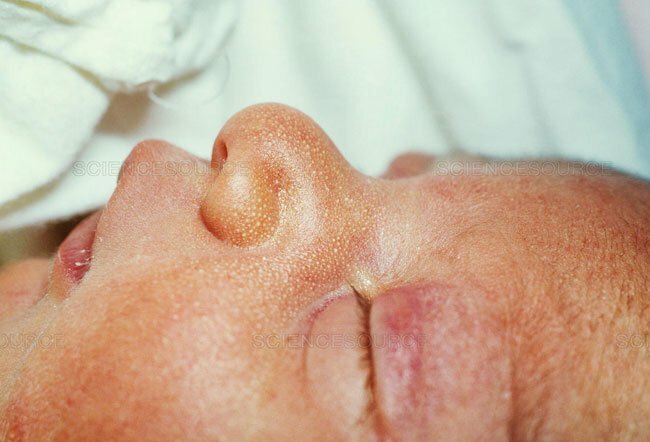 These appear as small white papules and are caused by poorly functioning newborn skin. Milia are generally seen on the forehead, cheeks, nose, and chin, but they can be seen elsewhere. Leave them alone, as they will disappear on their own within a month without any treatment. Oral thrush is caused by a yeast infection in the mouth. It appears on the tongue and gums and is bright red with white plaques (looks like dried milk curds). It is a common infection in infancy and may be brought on by poor oral hygiene, antibiotic usage, or other immune problems. In babies, it is most often associated with either antibiotic usage or poor oral hygiene. The doctor may need to prescribe an antifungal medication such as nystatin (Mycostatin, Nilstat, Nystex). Babies can be very sensitive to perfumes and harsh detergents. Use a gentle unscented detergent when washing infant's clothes and bedding. Doing so will help prevent allergies or sensitivities. Jaundice, also called hyperbilirubinemia, is commonly seen within a few days of birth. It appears as a yellowing of the skin, mucous membranes, and eyes. Oftentimes it is caused by a normal breakdown of red blood cells which releases bilirubin (hence the name hyperbilirubinemia). Most commonly the condition resolves on its own, but occasionally when the jaundice is severe, treatment may be required. Always speak to the pediatrician about any concerns. Babies don't benefit from a tan! An infant's and child's skin is very sensitive and can easily burn from sun exposure, causing real and even permanent damage. If the baby is going to be outdoors, it is important to avoid direct sunlight. Sunscreen is not recommended for infants under 6 months of age, so use a hat, umbrella, or other protection whenever possible. For infants over 6 months of age, always apply sunscreen as well. If it's suspected that the infant has a sunburn, call the pediatrician for advice. Most skin-care products should not be used on very young infants because of the risk of exposure to active chemicals, which may be absorbed at higher rates in the thinner, less developed skin of infants. Avoid products with dyes and fragrances, since these may result in allergic reactions. 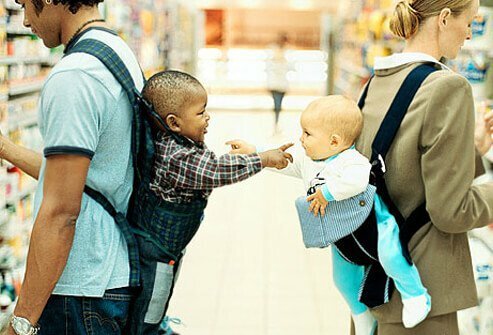 Always discuss with the pediatrician which products can be used on infants. Bathing an infant can be a gratifying and enjoyable experience for both the parent and child. Remember, however, that an infant's skin is very sensitive so try not to "scrub" too hard. Never leave an infant unattended in any amount of water, since drowning is a real risk. A number of recent studies suggest that gentle massage can improve an infant's sleep and decrease stress. It also is a great way to bond with an infant. Try not to massage too vigorously after feeding, since it might cause the baby to spit up. 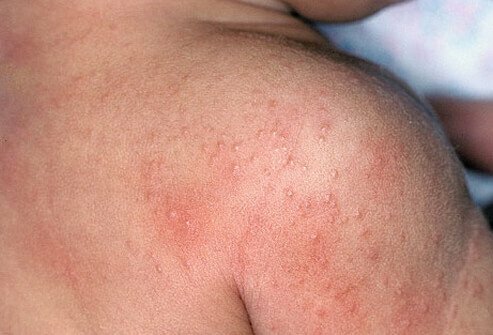 Most skin rashes in babies are not serious and require little to no treatment. There are some rashes which may require further evaluation. Any fever associated with a rash requires an evaluation by a physician. Rashes which involve blisters or other fluid-filled bumps (pustules, vesicles) may also need to be evaluated. In general, never hesitate to contact the pediatrician with concerns. Copyright © Bart's Medical Library / Phototake -- All rightsreserved. “Color Atlas of Pediatric Dermatology”; Samuel Weinberg, Neil S.Prose, Leonard Kristal; Copyright 2888, 1998, 1990, 1975, by the McGraw-HillCompanies, Inc. All rights reserved. Copyright © Watney Collection / Phototake -- All rights reserved. 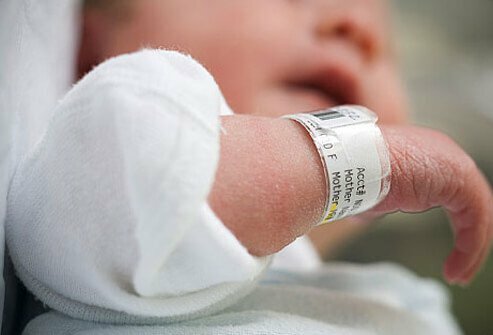 American Academy of Family Physicians: "Newborn Skin: Part I. Common Rashes." American Academy of Family Physicians: "Newborn Skin: Part II. Birthmarks"
American Academy of Pediatrics: Manipulative and Body-Based Medicine"Efficacy of Healing Touch in Stressed Neonates." American Academy of Pediatrics: Patient Eduacation Online "Diaper Rash." U.S. Food and Drug Administration (FDA): "Should You Put Sunscreen on Infants? Not Usually."